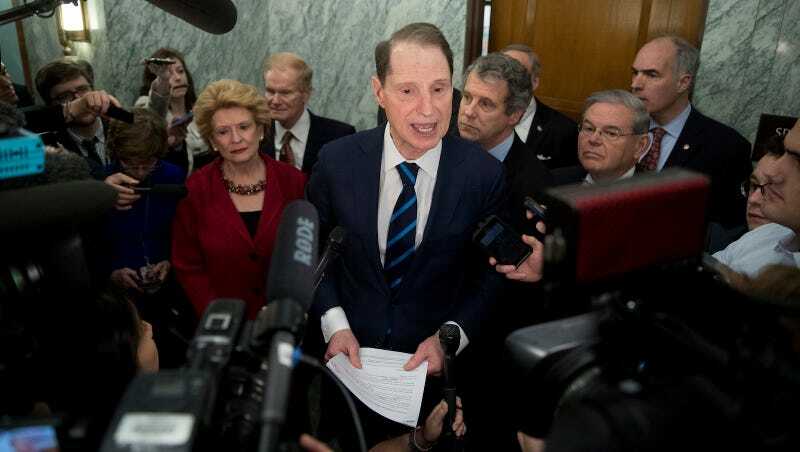 Sen. Ron Wyden (D-Ore.) and other Democratic senators discuss opposition to Human Services Secretary nominee Rep. Tom Price on January 31, 2017. Image via AP Photo. After Democrats refused to show up for the vote on Cabinet nominees Steven Mnuchin and Rep. Tom Price—an obstruction tactic waged amid intense pressure from the left, which has strengthened in reaction to Trump’s absolutely terrifying first week—Senate Finance Committee Chairman Orrin Hatch (R-Utah) has, as the Washington Post puts it, “suspended his committee’s rules”—what?—and advanced both nominees anyway. Quorum rules require a member of the minority party to participate in confirmation votes. Not anymore, I guess! It’s very likely that all of Trump’s Cabinet nominees will be confirmed eventually no matter what, since Republicans hold a 52-48 majority in the Senate. That in itself is kind of crazy, when you think about it, considering Trump hasn’t exactly showered love and respect upon the legislative branch, and his top advisor wants to “destroy the state,” and his merry band of nominees is largely objectionable even apart from partisan issues, including, as it does, a close friend of Russia, a billionaire GOP donor with no experience in public education who may have plagiarized her questionnaire, and, of course, Mnuchin and Price—the former who literally profited from the Bernie Madoff ponzi scheme, the latter who may have violated the STOCK Act. Democrats are also currently boycotting the Environment and Public Works Committee hearing for Scott Pruitt’s nomination to lead the EPA. “We took some unprecedented actions today due to the unprecedented obstruction on the part of our colleagues,” Sen. Hatch said in a statement. What does unprecedented mean again? Sen. Tom Cotton (R-Ark.) held up Cassandra Butts’ nomination for ambassador to the Bahamas for two years, reportedly in order to “inflict pain” upon President Obama. Butts died before getting confirmed.